The Sa skya religious system is an amalgamation of diverse traditions. Both Dkon mchog rgyal po, the founder of Sa skya, and his elder brother ’Khon Rog shes rab tshul khrims, felt the need for thorough reforms. . . . Dkon mchog rgyal po, like Mar pa, the great guru of the Bka’ brgyud pa, was sent to study with the great teacher ’Brog mi. From ’Brog mi he received the Three Tantras of Hevajra (Kye rdo rje’i rgyud gsum)—the Hevajra, Vajrapa, and Sampuṭa Tantras—and the initiations of the New Tantras. These new doctrines he skillfully grafted on to the mantric practices of his ancestors, to whom they had been transmitted by Padmasambhava. This fact explains the particular reverence the Sa skya have for Gu ru Rin po che. It was not, however, until the organization of these various elements into a doctrinal system by the great Sa chen Kun dga’ snying po that we can speak of a Sa skya sect. In the section dealing with the third system, that of the spiritual advice concerning Lamdré (“The Path and Its Fruition”), are found the primary source—The Vajra Verses—and its commentaries, as well as the source text on The Inseparability of Samsara and Nirvana, with the instruction manuals and explanatory essays concerning this text. The section also includes the empowerment for the “pith instruction” tradition of Hevajra; texts from the extensive, more direct, and extremely direct lineages of the Lamdré teachings; the instructions on threefold purity according to the tantra The Vajra Pavilion; the “eight later cycles concerning the spiritual path”; and the “spiritual connections of the six avenues.” The auxiliary instructions include those concerned with Parting from the Four Kinds of Attachment; a ritual to honor the gurus of the Lamdré School; and the authorization for the eight deity mandala of Vajra Panjara Natha, the guardian deity of these teachings. Source: Richard Barron, The Catalog of the Treasury of Precious Instructions, p. xvii. lam 'bras kyi gzhung ji lta ba bzhin dkri ba'i khrid yig tshigs bcad ma, by ? ngor chen rdo rje 'chang ? Instructions on the three aspects of purity as the enlightened intent of the explanatory tantra Vajra Pavilion, by Chögyal Pakpa, also known as the commentarial tradition of Lamdre without the source text. 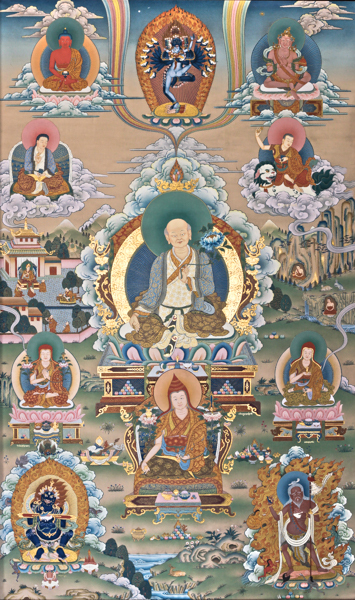 The instructions known as the spiritual connections with the six gatekeepers, which are the pith instructions of Śāntipa’s Practical Methods Blending Sutra and Tantra, Nāropa’s Dispelling the Three Kinds of Suffering, Vāgīśvakīrti’s Clear Recollection of the Genuine State, Prajñākaragupta’s Guarding against Obstacles Due to External Negative Forces, Jñānaśrī’s Removing Obstacles Due to Disturbances of the Body’s Elements, and Ratnavajra’s Guarding against the Mental Obstacles to Meditative Absorption. ↑ Vasubandhu, Treasury of Abhidharma, ch. 8, v. 39a–b. ↑ Maitreya, Highest Continuum, ch. 1, vv. 10c–11b. ↑ Barron, The Catalog, page 92: "(this latter text is also known as the Six Branches of Union according to the Hevajra tradition)". Note 187: The term Six Branches of Union (Tib. sbyor drug) is usually used in association with the teachings based on the Kālacakra Tantra. For a discussion of these practices, see Jamgön Kongtrul, The Treasury of Knowledge, Book 8, Part 4: Esoteric Instructions, trans. Sarah Harding (Ithaca, NY: Snow Lion Publications, 2008), pp. 293–330. ↑ Although this is the order given in Kongtrul's Catalog (p. 93), they appear in a different order in the actual pecha. ↑ This text does not have a title present in the Pehca. The Tibetan title was taken from Richard Barron. Author information was found in Jinpa, Thupten, trans. "Root Lines of 'Parting from the Four Clingings'." In Mind Training: The Great Collection, Volume 1, 517. The Library of Tibetan Classics. Boston, MA: Wisdom Publications, 2006.